The Font of Knowledge: Anyone for Scorzonera? Klause has spent many years learning the art and craft of vegetable growing, experimenting with different plants and techniques, and passing on his knowledge to countless students of all ages. The last ten years have been spent in Ireland, where you could say that his teacher has been the Irish climate and Irish conditions. So he has mastered the vagaries of boggy soils, high rainfall, the most common pests and diseases, and has dispelled what he has learnt into this book. It embraces everything from lazy beds to green manuring; there’s even a section on the common mistakes beginners make. This book will be an invaluable source of information for vegetable growers here – novices and experienced alike. I was interested in this book because my daughter Barbara has organised a vegetable plot in the grounds of a local Church of Ireland site and intends to grow her own vegetables for herself and her partner when he is visiting the city (and the possible table of her father and step mother, Louise!). Her partner is a long-standing vegetable growing enthusiast and she has been affected by him in more ways than one. 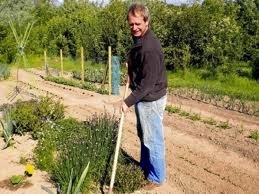 Klaus deals in short sections with each of the forty two different vegetables which he deems suitable for the Irish climate and Irish soil. They are arranged in alphabetical order starting with Artichoke Globe, Artichoke Jerusalem, Asparagus, etc and finishing with Sweet corn, Swiss Card and Turnip. Each section contains a black and white drawing of the vegetable concerned and there are 24 full-page photographs of some of the vegetables in a later section and of the staff at work. I was struck by the beauty of some of the vegetables such as the Dutch Cabbage, the Butter head Lettuce and the Borage ‘’an edible flower which lifts the spirit’’. 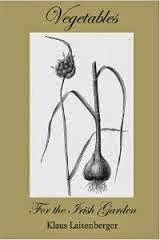 The author devotes three or four pages to each vegetable including nomenclature, botanical classification and an introduction, which includes the plant’s history. He advises re suitable soil and site, sowing and planting techniques, rotation, plant care, harvesting and storage. He advises about the quantity produced, varieties available and, finally, a note about potential problems which are endemic to each vegetable. All in all, his approach to vegetable growing seems an easy and fulfilling occupation. Barbara's plot; the first season's fare. With practice and with the aid of this book, it should be easy and satisfying to have each household provides its own vegetables. It is a shame therefore that those of us who are largely depending on home cooking by our providers or partners are limited to such mundane fare as peas, traditional Irish cabbage and broccoli when we could be titillated by Kohlrabi, Oca, Celeriac and an occasional Pumpkin or the tempting Scorzonera and Salsify. Are such delicacies forbidden fruit on the part of our cooks when our affection and love, not to mention the serenity of the household, could be encouraged in more ways than one by a greater variety of vegetable fare?